You’re going to need these materials for this “how to make custom gifts for less than $30” tutorial. Some of these items you may already have at home or you can skip all together if you can hand draw your artwork. We are well under our $30 budget, so feel free to get creative with what you have left, or if prices vary for you, then there’s still room for you to stay under budget. If you don’t have a craft store nearby, try these options on Amazon. If you purchase the burner at Hobby Lobby or Michaels, grab one of their coupons and drop your cost significantly by 40% – 50%. You can find them online or in your local paper. Your burner is a one time upfront cost and can be used over and over, so the cost of the burner would be spread out among several gifts, making each gift cost less to make. If you feel comfortable hand drawing out your artwork, you can skip the carbon paper, tape and printer access. If you need these items for your artwork, some of them may already be laying around your house like pencil and tape. You can make your own carbon copy sheet with a pencil and I’m going to show you how step by step below. 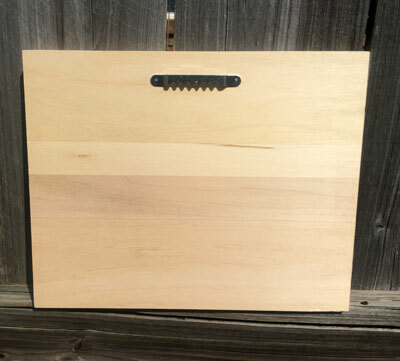 Use your remaining budget to buy a wood canvas. 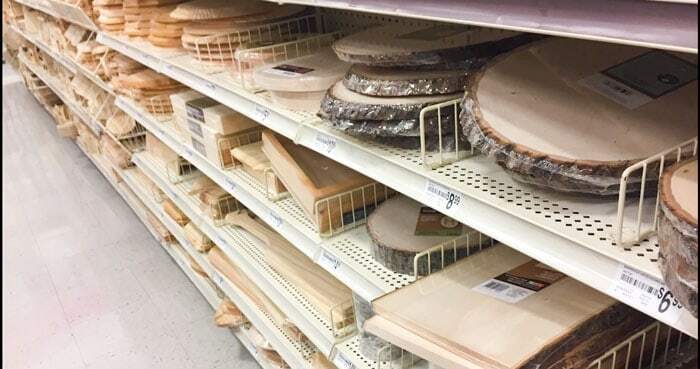 Or you can buy several small wood slices to make coasters or ornaments. Tip: If you already own a sander, try looking around at your local trhift stores. I have found wood canvases before for $0.50 that just needed sanding. Anything that is raw wood can be a canvas, cutting boards, wood spoons, and old artwork. 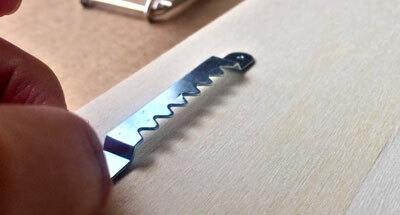 Don’t burn MDF or wood that has been varnished or painted, RAW WOOD ONLY. For $8.00, I bought a basswood wood canvas at Michaels Arts and Crafts. The size is 8″ x 10″. That’s a great size for working with an at home printer. 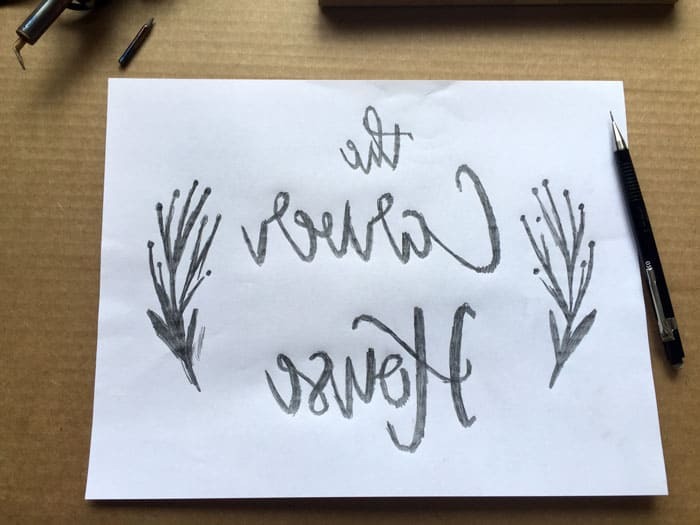 We can print one artwork template sheet to transfer to our wood. If you have a text editor you’re comfortable with like Microsoft Paint or a layout editor already on your computer, go ahead and use those. I’m going to demonstrate using Photoshop. If you don’t have a layout editor, download GIMP online for Free at GIMP.org. 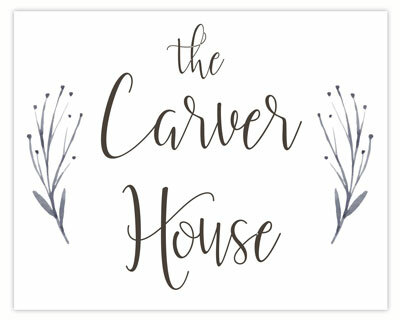 For extra graphics you can download and add to you artwork, go to VectorStock.com. and at the top of your browser, you’ll see a tab that says, “Free Vectors”. Once you click that button you see all of the free options available for download for free personal use. These can really add some great details to your custom gifts. Other gift ideas: sports teams logos, favorite company logos, favorite movies, or favorite bands. Open your layout editor. The first thing you want to do is create your document to the exact size of your canvas, which we already know is 8” x 10”. 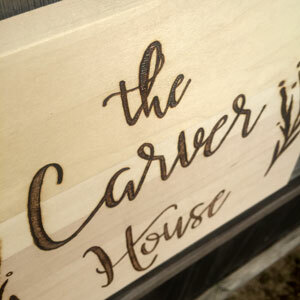 That will make it easier for us to size our letters and artwork to the scale of the wood canvas. Create the carbon by rubbing your pencil on the back of the template artwork. 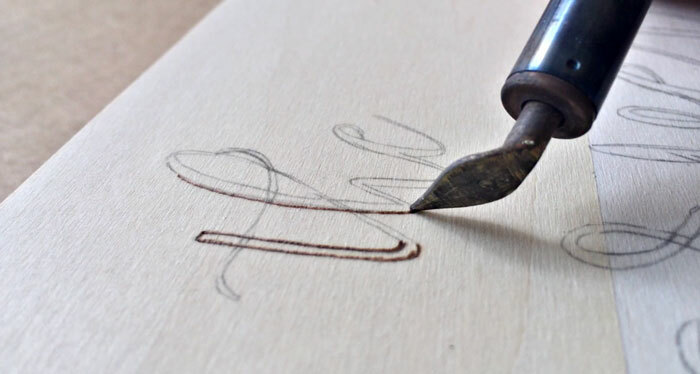 It doesn’t need to be neat and pretty, you just need to get the pencil carbon on the back so that when you trace it out, you will leave a carbon impression on the wood canvas. Add the Pencil Carbon to the back. Carbon Trace the entire template on the back with your pencil. Once you’re done with adding the carbon, flip it over, align it on the canvas as centered as you can get it, then tape it to the top of the canvas. Then start tracing out your letters and graphics. Tape your template to the canvas and start tracing. Turn on your burner, the Walnut Hollow starter burners take a while to heat up and cool down, so keep that in mind. The first thing I do is burn an outline of the traced artwork. I find that it makes it a little easier to fill in the artwork when it has been outlined first. That also keeps your mistakes down to a minimum. I’m using this pointed/shader tip so I can outline and shade without having to change my tip. Because the burner takes so long to heat up and cool down, changing tips out can be time consuming. This two in one versatile tip makes is easier. Experiment with different patterns. In the video above, you’ll see that I use a straight line pattern and a simple shade pattern to fill in my graphics. 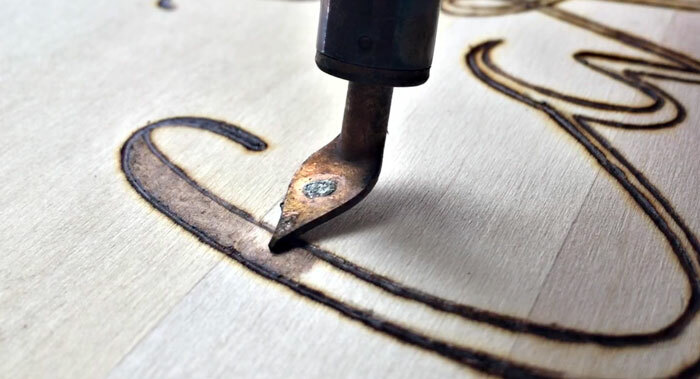 Outline your traced letters with the wood burner. Start shading! Experiment with different patterns. Once you’re done burning, add your backer and you’re all finished! These make great gifts for anniversaries, weddings, baby showers, graduations, christmas and special occasions. 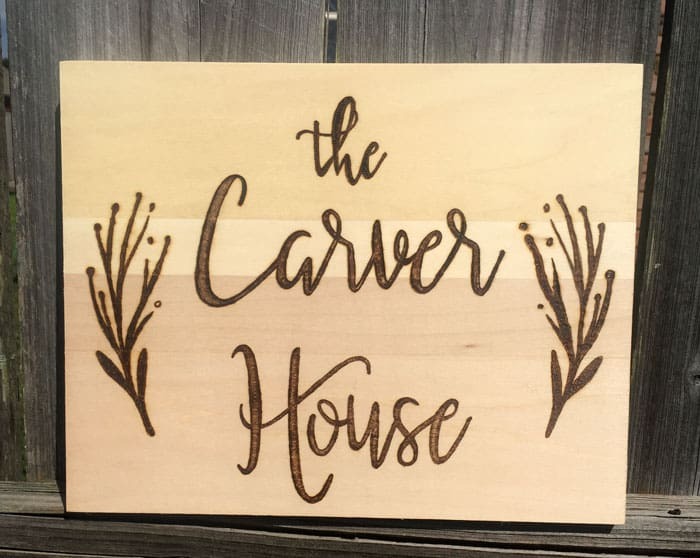 You can download all kinds of free graphics and free fonts to create templates for wood burning. It’s a very versatile art form for creating custom gifts, signs and artwork. Leave comments about different types of gift suggestions below! I would love to know about the types of gifts you’ve made! Grab some scrap wood from one of the bog box stores like Lowes or Home Depot. They may have some left over wood cuts that are less expensive than the art wood cnavases.